To understand the importance of the Israel Pavilion in Shanghai, it is necessary to understand the history of the ties that bind these two ancient peoples. The story of the Jewish people in China spans centuries and is one that continues today. Jewish communities grew throughout China, in cities like Kaifeng, Harbin and Tietsin, and the history dates back as far as the 8th century, though none of these communities grew as rapidly or as large as Shanghai. The great influx of Jews to Shanghai began in the second half of the 19th century and continued to grow in bursts through the end of World War II. The city was known as a bustling international trade and commerce hub, free from anti-Semitism and ripe with opportunity. At its height during the Holocaust, this Jewish community, the largest in China, stood at nearly 50,000. While for some it was a haven safe from pogroms and persecution, for others it was a great commercial opportunity, an incredible adventure and a gateway to Asia. The imprint China made on the Jews that lived there was great and deeply personal and there were no shortages of landmarks left behind. These include synagogues, cemeteries, schools, factories, hotel empires and power companies. The collective memory of these two peoples started to grow anew with the formal establishment of diplomatic relations between China and Israel in 1992. A steadily growing exchange in trade, the sciences, technology, art, culture, the environment, humanitarian aid and agriculture has since blossomed. It is in the spirit of this friendship that Israel eagerly accepted the invitation to participate in the Shanghai Expo. The Israel pavilion, designed by leading architect Haim Dotan, in collaboration with designer Prosper Amir, stands as a tribute to the history of the Jewish people in China as well as to the over fifty years of friendship between Israel and China. It is also a special expression of gratitude to the Chinese people for providing Jews with a safe haven during the Holocaust. It is an important statement as to the past, present and future friendship of these two nations and their people, each steeped in their own rich history and tradition. 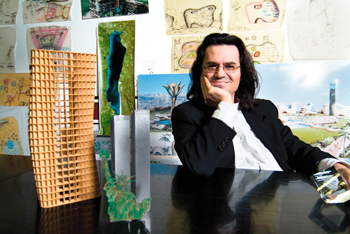 For architect Haim Dotan, beneath the shiny uber-modern designed seashell shaped pavilion, there is a deeper message. It is personal. His design reflects a true cultural sensitivity passed on to him by his family. The design, reminiscent of two hands intertwined with one another, marks the culmination of the past, present and future between the Jewish people and China, of his family and the city that sheltered them. It reflects a careful counterbalance of yin and yang, past and present, temporality and eternity, earth and sky, and suggests the influence of eastern philosophy. For Dotan, this journey to China-to Shanghai, is a return to his roots and an unearthing of the story of his family. Now, nearly 100 years later as Dotan creates the foundation for the Israeli pavilion in Shanghai, he still pays great homage to his family’s history. The pavilion, in many ways, stands for the full circle that Dotan himself has symbolically created in his return to Shanghai on behalf of the State of Israel. In 1919, the Saidoff family, Haim Dotan’s grandfather, aunt and grandmother, like others, sought refuge from the pogroms in Bukhara, in the South of Russia. They fled to Shanghai and settled there in search of a new life for themselves. Haim Dotan’s mother, Victoria Saidoff, was born in Shanghai during that period. In looking back at their life in Shanghai, Dotan believes his family lived in the Hongkou district, a popular haven for Jews in Shanghai in the early half of the 20th century and was told the family resided possibly on Shapour Street, No. 18. Through the efforts of friends in China eager to help Dotan in his search, he discovered that, perhaps instead, it is likely that the family actually lived on Xia Hai Pu Road in the Houkong district located near the Suzhou River. The exhibition stands as a gallery of inspiration and a symbol of the friendship between the two countries. The Whispering Garden, located between the plaza entrance and the Israel Pavilion, greets visitors by whispering in both English and Chinese as they enter the arena via a shaded path lined with trees. In contrast to this serene commune with nature and its introduction to Israeli architecture, the Hall of Light features a 15-meter high screen that flashes with films, highlighting Israel’s technological advancements as well as key historical innovations from Biblical times forward, including a Jewish heritage exhibition. Clear glass allows sunlight to flood the space giving a sense of warmth and optimism. The heart of the exhibition and the climax of the experience, though, lies in the center in the Hall of Innovation at the core of the pavilion. There, dancing light balls illuminate the space and beam messages, in Hebrew and Chinese, connecting Israeli children, scientists, doctors and inventors with the visitors. Then, a dynamic audio-visual presentation of balls of light projected on a 360-degree display highlight some of the most remarkable Israeli achievements in fields that include: archeology, agriculture, medicine, renewable energy, science, music, literature, R&D and security. 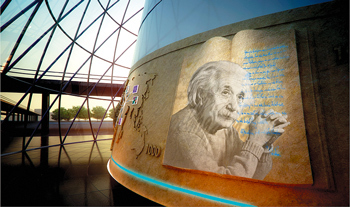 While this prodigious interactive displays offers insight into some of the most remarkable Israeli achievements, the piece de resistance however is the message that connects the future of Israeli innovation with that of China. The pavilion is an impressive monument to the future of technology, development and innovation. It is also a clear testimony to the power of Israeli creativity and the Israeli belief in the wonderful possibilities that the future holds for humankind. 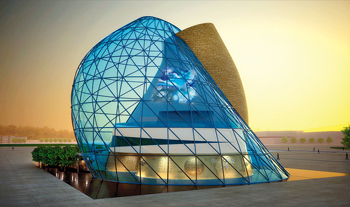 Israel’s leading innovations and technological developments will be exhibited in this spectacular multi-media show, using the most up-to-date presentation equipment housed in this intricately designed pavilion that stretches across 2,000 square meters. With an eye towards the future, all Shanghai is now abuzz with commotion and frantic activity as the countdown to the Shanghai Expo in May quickens. Even the most staidly of city dwellers is transformed by the atmosphere, yet Dotan’s creation stands out with its quiet love for China, its firmly founded philosophical foundation and its carefully crafted idealism. While speaking to the exhibition theme “Innovation for Better Life”, the pavilion encapsulates past, present and future in the most personal way.